Roger & Gallet has launched Amande Persane, a new fragrance inspired by the almond and citrus trees in the 'Garden of Paradise' of Ispahan. The notes include bergamot, orange, bitter almond, iris, tonka bean and Atlas cedar. Amande Persane was developed by perfumer Delphine Jelk. I have to admit – these notes sound fantastic. I wonder about the quality…. You know, I think they generally do a great job. The Eau Fraiches are body sprays more than perfumes, if you know what I mean, and they’re not generally the sort of stunning compositions that will make you faint with pleasure, but they’re well-done for what they are. And the soaps are wonderful! But have not tried this one, or even seen it. Thanks Robin! I do know about their soaps as I buy my mother their carnation soaps. She wore their Blue Carnation for years. 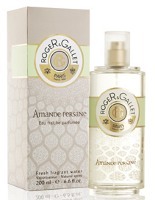 Roger and Gallet have such an intriguing range of wonderful looking products and I do love almond and citrus. My mind’s already working on the endless layering possibilities. Might as well give it a shot then! The only Roger & Gallet items I’m familiar with are a couple of their soaps that have been around forever – love ’em. I’d like to try some of their fragrances – seems like they would be nice for a little around the house aromatherapy when in the mood for something simple but pretty. Yes — most of them are light & summery & good for when you don’t want heavy perfume. This sounds like a must try-Almond, Iris and Tonka are loves of mine. Roger & Gallet makes lovely products that are reasonably priced, especially their French-milled soaps. I am bummed though, that since Loreal purchased the company, R & G has discontinued one of my all time fave scents, Bouquet Imperiale. I have been buying up the soap and cologne where I can find it. I think I see quite a lot of that still at discounters. You should stock up online if you’ll miss it that much. Yep! I found a few bottles on discounters for a song, and scooped them up. I am a sucker for almond anything, so this will doubtlessly be something I blow part of a paycheck on. At least it won’t take the whole paycheck! Do they make anything in eau de perfume concentration? I see on their website that they call their scents “scented soft water”, and on Escentual their fragrances are described as “fresh fragrant water”. (and I’ll take “fresh water” over “soft water” but they sdo ound awfully light). Anyway, this sounds like it could be a very very light version of Après L’ondée, so that keeps me interested. So far as I know, they’re all “Eau Fraiche”. I don’t think this is available yet, is it? I know it’s probably quite “thin” and “light” but that might be nice when it’s hot out….not that it’s ever going to be hot here in the frozen north….actually it’s not bad today. They’re talking record temps here tomorrow! Record cold or record hot? Hot – mid 80’s (about 15 degrees above normal for early April). Portofino doesn’t do the trick, eh? I don’t recall any almond in Portofino….must grab that bottle and sniff it good! Of course right now I’m pretty well saturated in Bel Respiro…….I can be green now and then….plus I need to wear it once in a while before it’s been used up by the green-girl in the house! I will say that the R&G I’ve experienced, while ok for a refresher, is more along the lines of an Aqua Allegoria than anything. hey! Rapple said it NOT ME…..sheesh….I don’t know why you think it’s always ME buying perfume at the drop of a hat…. Joe – I’m pretty heavily stocked on vintage Guerlains and other “heavier” orientals, so I NEED something lighter. Anyway, that’s my story and I’m sticking to it! I think the professionals call it “projection”. LOL! And actually, you’d be very surprised at how few bottles and decants I do have. Now the Empress…. that’s a whole ‘nother story! Shhhh!!!! I hear her coming… actually, I smell her sillage before I hear her Nikes. you know—it’s really hard to concentrate at the grocery store when I can just tell that you guys are talkin smack about me….. Officer, I saw that perfume bottle jump right out in front of Daisy! Honest, she was just minding her own business and the thing jumped her! If she hadn’t taken it firmly in hand and pressed that nozzle, it would have attacked all of us! YEAH! See? I was performing a public service!…..or….something…..
It’s true…I would throw myself on a live perfume bottle to say y’all. that would be “to save” y’all —-it’s early, no coffee yet…. A fickle scent, this, since I could have sworn it was throwing itself at ME! I love citrus, love almonds…this sounds lovely! Uh oh. Houston, we have a problem. I’m just thinking this will be similar enough to Portofino that I won’t need any. That’s the story I’m telling myself. Love the name though. Oh, could be. Or not! Almond is generally a “no” for me, but I do like their Bois d’Orange as a nice citrus scent. They are lightweight and you need to spray with abandon. The Bois d’Orange is nice, agree. This one sounds lovely. I will have to try it, since one of my fave summertime spritzes is Extra Vieille (or is it known as Jean Marie Farina?). So refreshing when it’s hot out. Coincidence – I just ran into a display of R&G last week and spent a few minutes trying them all. Bois d’Orange and Gingembre are quite nice, but to me the rest share a shrill-ish vibe that I do not appreciate much. I’m a sucker for anything almond though. Ack. Now I’ve confused myself.